Enstatite is reasonably well known among collectors, it is typically a deep brown or brownish-green gem material. There is one known locality that for decades has produced a trickle of the rarest color variety of this gem - absolutely colorless stones. Embilipitiya is a interesting find as it also produces the scarce colorless Iolite (Cordierite) that is not found elsewhere. We get precious few of either of these and even fewer than normal in the last few years. 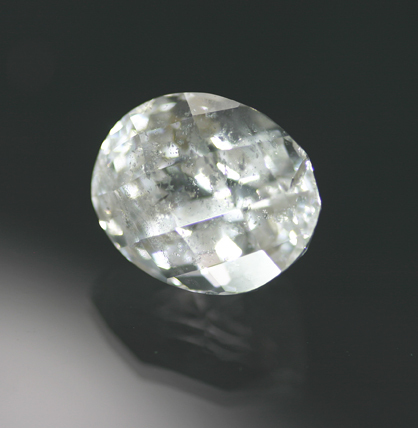 All of this before mentioning the size, the single largest example of this variety that we have heard of - a remarkable 35 carats. Some slight, low relief inclusions that are well hidden with the checkerboard style crown. Bright and extremely impressive in its size and lack of color. An unusual variety that is a great conversation starter for the gem enthusiast.